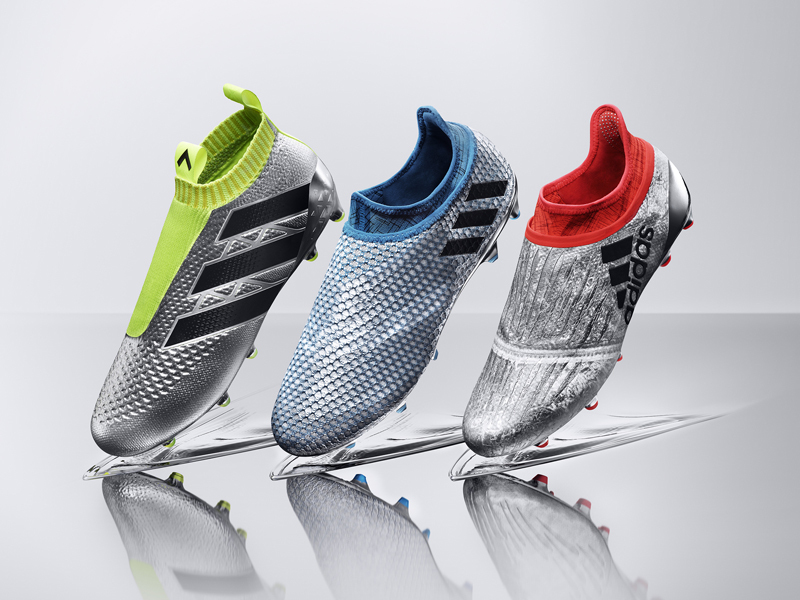 Herzogenaurach, 20th May 2016 – adidas Football has today unveiled the Mercury Pack, a cutting edge range of boots inspired by the trophies that players around the world strive to win in order to write their names into the history books. The three unique chrome boots have been designed to embody the focus and desire that footballers have to achieve success and beat their rivals to finish first in order to claim the biggest prizes in the sport. The three boots – X16+ PURECHAOS, Messi 16+ PUREAGILITY and ACE 16+ PURECONTROL – will be worn for the first time by star names including Leo Messi, Paul Pogba and Gareth Bale during the UEFA Champions League final, UEFA Euro 2016 and Copa America. The X16+ PURECHAOS features a state-of-the-art PURECUT SOCK SYSTEM, which covers the boot laces in order to not only give players the ultimate fit but also provide a more aerodynamic effect. This makes it the perfect boot for the likes of Gareth Bale who will be wearing the X16+ PURECHAOS at UEFA Euro 2016 this summer. The ACE16+ PURECONTROL also gets the Mercury Pack treatment following its launch earlier in 2016. The first high performance laceless boot has already made an impact on the pitch but as players head to the biggest tournaments of the summer, the ACE16+ PURECONTROL has been given a stunning chrome treatment. Paul Pogba, one of the most talked about players in the world, will wear the ACE16+ PURECONTROL as he aims for international glory on home soil. The final boot in the Mercury Pack collection is the MESSI 16+ PUREAGILITY. Created for the greatest footballer of all time, the boots not only feature the PURECUT SOCK SYSTEM but also a PUREAGILITY HEEL LINING, which delivers the ultimate fit allowing players to create the moments of inspiration on the pitch. Leo Messi himself will debut the MESSI 16+ PUREAGILITY when he leads Argentina in the Copa America. "Every night I dream of winning. I dream of being the best and I dream of lifting trophies. For me it's about coming first, never second. Chrome is the colour of winners and to have my boots reflect that winning mentality inspires me even more for every moment that will decide the legacy of my team mates and I this summer." The three boots in the Mercury Pack will be worn on pitch for the first time at the 2016 UEFA Champions League final. The world's top players will also be wearing the boots at the UEFA EURO 2016 and the Copa America tournaments. For further information please visit adidas.com/football​​ or go to facebook.com/adidasfootball​ or follow @adidasfootball​ on twitter to join the conversation.